Captain David Mangum has spent the better part of his life navigating Florida’s coastline and waters. He’s been fishing since he was little but found his passion in fly fishing, pursuing a guiding career that brings him out to the water almost everyday, from the Florida Panhandle to the Bahamas. 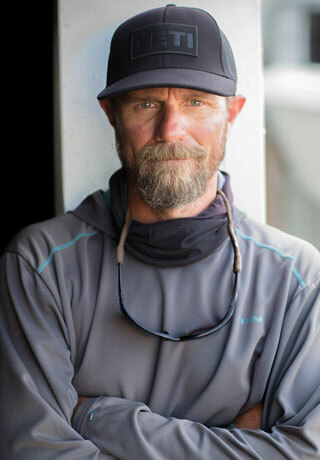 When considering his work, Mangum said, “The wheels in my head are always turning, thinking about the fish, the where, when, and most importantly, why. Sometimes those analytics can be torturous, a voice that never shuts up or turns off. But that’s the same process that drives exploration.” When not poling his skiff, David is at home in Santa Rosa Beach, raising his family. What is the wind direction and how hard is it blowing, what is my tide window when and where, the weather and the tide run the days of my life. Where is your favorite place to go fishing? I’m Florida born and bred, and I couldn’t live anywhere else. The Gulf of Mexico will fascinate me forever. I would learn how to balance family and work better. There is a constant tug-o-war between the desire to be on the water and to be with my family, especially since the birth of my daughter. Now 7, my daughter loves her time on the boat and I’m getting closer to bringing both worlds together. Steve Huff, his work ethic outshines all. I love the freedom the water provides but hate the “drama” that can be associated with tarpon fishing and tarpon “spots”. The sound of my daughter singing made-up nonsensical songs, completely carefree…. what could be better than that? And the sound when I turn the key in the skiff in the A.M.. I would pursue a job as a photographer, hunting for images. Teddy Roosevelt. He was an incredible sportsman while holding the distinction as one of the original conservationists.